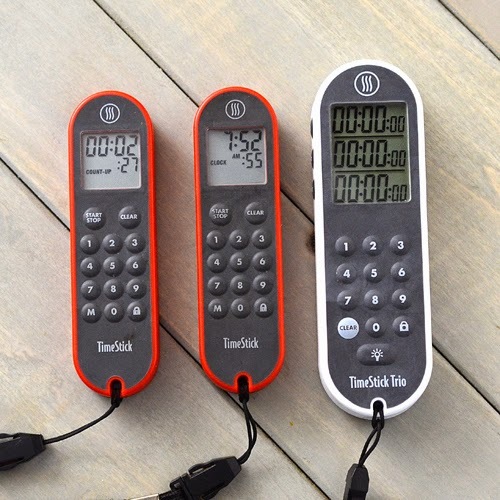 This week Thermoworks released their newest addition to their line up - the TimeStick Trio. Last year I bought a pair of the TimeSticks and wrote about them, giving them high marks. I still use those TimeSticks as my main timers and I still love them. The TimeStick Trio is their big brother - three timers in one device. TimeSticks (red) and TimeStick Trio (white). Like brothers, the TimeStick Trio shares many features with the TimeStick. The splash proof designs mean you don't have to worry about a little weather or grill table spills. The rubberized keyboard is grease resistant and easy to clean after you use it with greasy 'que fingers. A powerful magnet makes it easy to temporarily mount the timer on your fridge, grill facings, or other metal surfaces. I keep mine on the fridge. When Trevor comes home from weight training every night he heads straight to the fridge to make a recovery shake and he isn't bashful about slamming that door around. The TimeSticks have never fallen off. The lanyard is my favorite feature. I used to be bad about setting the microwave timer and then leaving the area to never hear it going off. I take the time stick with me. Anyone seeing me at a contest or event has seen a TimeStick around my neck. The units feature a keypad lock so you can carry it in your pocket without accidentally hitting a button and messing up your times. Also, just like brothers, the two have some differences. The TimeStick Trio adds a back light for being able to read your timer in dim lighting. The controls for both are similar but slightly different. For someone who has never used either, I think that the TimeStick Trio controls are easier to use. But if you have been using a TimeStick for a year and then switch to a TimeStick Trio like me, it is just different enough to be awkward because the clear and stop/start buttons are in different places. My neighbor, John, had fun picking on me when I repeatedly kept hitting the wrong buttons at first. Be careful with placement on grill facings, as the TimeStick Trio operating range goes to 104°F. 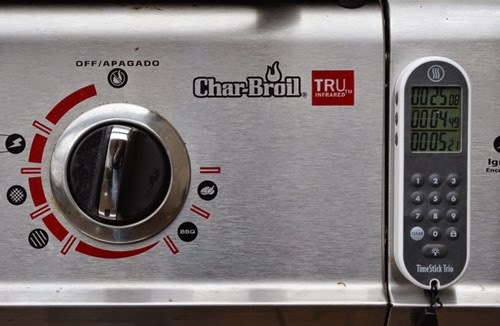 The plate by the control can heat up during cooking so put the timer on the facing out by the side shelves as shown here on my Char-Broil Gourmet. Obviously this would be useful as a general timer but specifically I thought of these applications. The first that comes to mind is these are great for tracking up to three of your meat categories for BBQ competitions. If you are doing a sort of multi-phase cook like ribs (naked/foiled/naked) and you are going by color or other indicators for your splits, you can do a separate tracking of each segment without losing your data. That's helpful when you are doing recipe development. 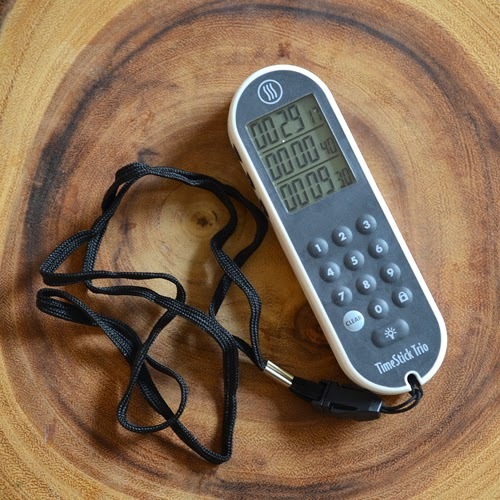 On the deck or in the kitchen, the TimeStick Trio is great for keeping track of cooking times for your main course and multiple side dishes all on one device that goes with you. The TimeStick Trio is currently priced at $35 and is available online through Thermoworks. 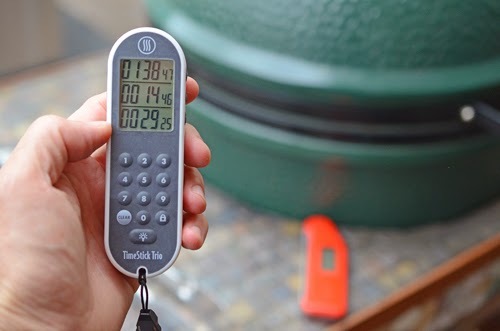 [Standard FTC Disclaimer] I received a TimeStick Trio from Thermoworks at no charge for review and I am on the Char-Broil All-Star team.